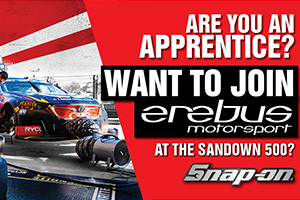 As part of DBC2’s role providing marketing solutions for Snap-on Tools Australia and New Zealand, and to leverage Snap-on’s sponsorship of Supercars team Erebus Motorsport, DBC2 put together a comprehensive apprentice based social media promotion. The promotion would offer two lucky apprentices the incredible opportunity to become an Erebus Motorsport team member for a day, with one apprentice taking part in the inaugural Sydney Supercars SuperNight 300, while another apprentice would gain experience with the team at the Sandown 500. Utilising a custom landing page, a targeted Facebook advertising campaign to specific Snap-on requirements and database collection, DBC2 led the strategy and roll-out of the campaign that was run across Snap-on Tools and Erebus Motorsport Facebook channels. With a significant amount of entries over the span of the promotion window, huge engagement, organic content opportunity as well as being a great way for Snap-on to support the future of the industry, the promotion was an incredible success for all parties, on all counts.